Martha working on her rug in her sun filled front room. She wore a white apron to reflect light onto her work area. Martha Stanley has been a member of the Santa Cruz guild for 40 + years. 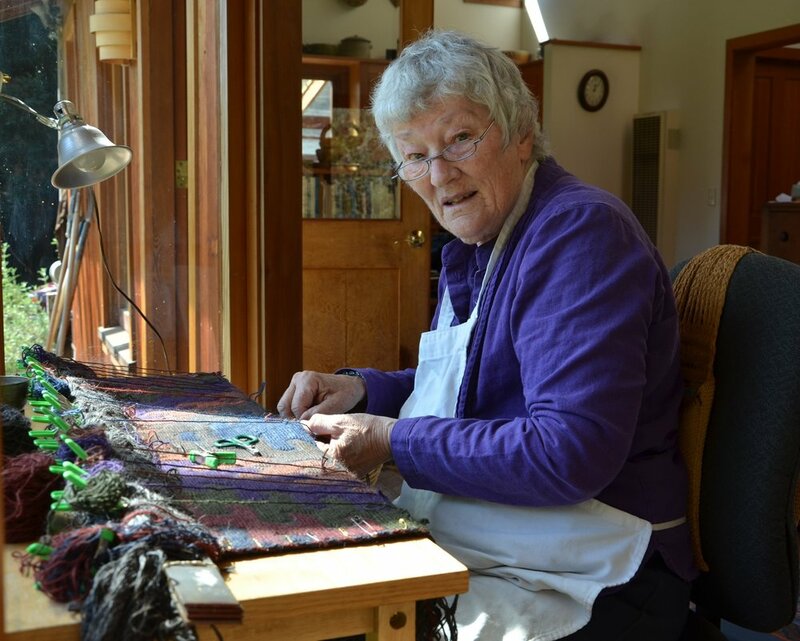 For many years, she taught rug weaving (including two workshops for the guild), she lectured and wrote articles for Handwoven, Weaver’s Journal, Spin-Off and others. She wrote the introduction and several chapters in “A Rug Weavers Source Book” (Linda Ligon, Editor, Interweave Press, Inc.1984). The list of techniques that Martha studied and mastered is quite long. To name a few: wedge weave, card-woven edges, Saha, twining, Peruvian sling braids, 4-selvedge weaving, scaffold weaving, and split ply braiding. Most recently, Martha moved to a new technique. After many long hours of research, study and sampling, she began using an off-loom technique derived from Anasazi sandal weaving to create her rugs. She calls it weft wrapping and twining. Martha’s work in this technique was included in a show entitled A Very Long Engagement in Halifax, Canada (2013) and Pittsburg, PA. (2015). “Some 100 - 1500 years ago in the Four Corners area of the U.S. Southwest, a highly developed sandal type was common. When I first saw early (300-600 AD) sandals I was stunned by the brilliance of their weavers, the Anasazi. The sandals, now termed scalloped toe puckered heel, were well worn and had as many as nine different weave structures. Earlier sandals were more like simple rectangles with most shaping, if any, done by decreasing the number of warp threads at the narrower heel areas. By the time these complex sandals became popular their weavers utilized different weave structures within the sandal for both shaping and for representing quite sophisticated symmetrical structures in two-three different zones, beginning at the toe and ending at the heel. When I was first introduced to the Alfred Kidder article A Sandal From N.E. Arizona in American Anthropologist (vol. 28 1926), I began trying to weave them. The different weave structures were a challenge to master, but not so much as the subtle difference in tension required to achieve the shaping. I was humbled and thrilled by the mastery and sophisticated choice of each weave where appropriate. These were remarkably savvy weavers indeed. 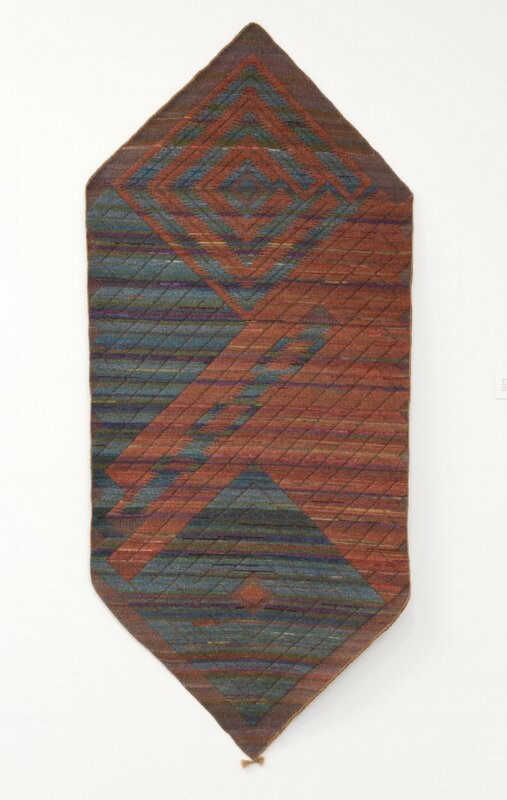 Since I have always been a rug weaver, several years later it occurred to me to try to adapt one of these weave structures into a rug technique. I chose the structure in the monochrome relief design area on the underside of the sandal. But I wanted to do this in multiple colors, which provided additional challenges to make this strong enough for a rug. The result of raised relief areas rising above the flat lower surface is a lovely addition to a rug. As the quality and intensity of the light level changes and moves at different times of the day, the rug reads quite differently -- as though it is alive. That is a wonderful asset in a stationary textile. This technique is quite slow to weave. Best worked on an untensioned warp at the edge of a table. And all hand done. I love it and am becoming accustomed to the time involved and the gradual emerging of the pattern.